For years, Justice Crew were a strictly singles-only band. In fact, it’s only because they’ve gotten attention overseas that they’ve decided to put out a legitimate studio album. ‘Live By The Words’ is almost like a greatest hits, with just five previously unheard songs present amongst their singles, some from over two and a half years ago! Whilst the group were initially written off as not being singers (a label even the group admits to) they have reached new heights thanks to high profile TV syncs. A cynical observer might even suggest that it seems like they only release a single if there is a TV show it might work alongside. That didn’t exactly work for current single ‘Rise & Fall’, which is a shame as it’s a pretty good song. Of the new stuff, ‘Ride Until The Sun’ is probably the best. It’s laidback but catchy, in the same vein as ‘Rise & Fall’. We’d even go so far as to say that it would have made a better single choice for before the album release. ‘I Love My Life’ is also quite good with its summery guitar riff. Its lyrics are a bit clumsy, but the boys aren’t exactly trying to be Shakespeare here. ‘Fly’ fits in seamlessly amongst all of the hits, but doesn’t stand out, whilst ‘Always Been Real’ has an irritating chipmunk effect that gets tired quickly. ‘Life’s A Party’ sounds under-produced, but that cynical side of us keeps whispering that it might be a ploy to produce a single version that fans would need to buy later on. Overall, ‘Live By The Words’ is a pretty apt description of the boys themselves; It’s fun, skin deep and generally agreeable. If you like what the boys have put out already, ‘Live By The Words’ is a nice little gift in time for Christmas. Download : (insert song you heard off the telly here), Ride Until The Sun. When they performed live on The Morning Show they sounded horrible. The white rapper guy was shown on camera laughing in the chorus and not even singing the words right. Says it all really. 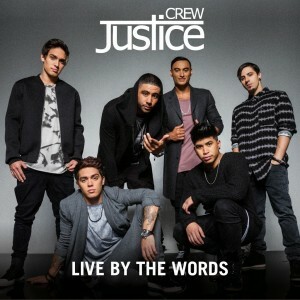 Justice Crew are like Guy Sebastian, without a Channel 7 reality show or Channel 7 program advertising them, they don’t perform well. With MKR starting again soon, I’m sure Justice Crew will get the promotion they need. The less we hear and see of Guy Sebastian in 2015, the better though, he is worse than Eddie McGuire.